The final week of January 2015 was to be the last of my three-week stay in Melbourne. I had developed quite a routine and produced a 5km result 2:45 quicker than I had before I left. 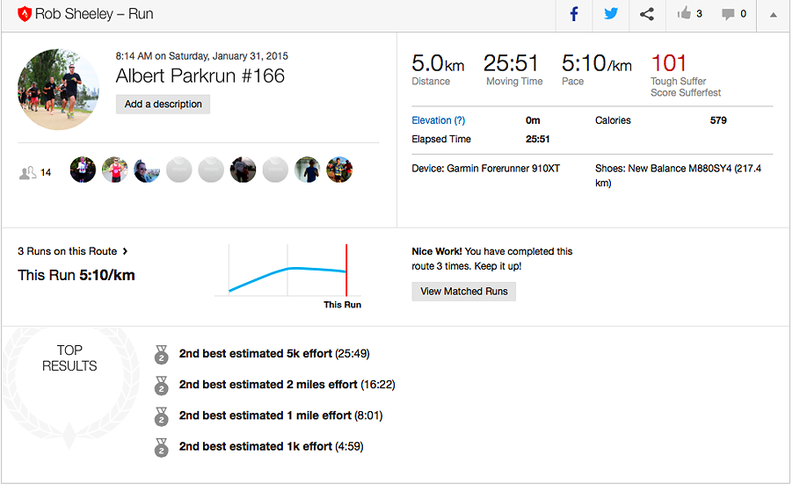 The week was all about consistency and seeing what I could manage in my last ParkRun of the trip. After a nice and gentle 5km on Tuesday I took a different approach to my 35-minute tempo run on the Wednesday. I had been warming up at Victoria Park every day and decided that I would complete the trek exclusively around that field. It was made even more interesting when the irrigation sprinklers came on in different sections of the park as I ran through. I copped a couple of drenchings. After another easy 5km on Thursday, I had a rest day before Albert Parkrun on Saturday. Based on a week earlier, I thought I might try to put myself in a similar, if not better position to try and break the 25-minute mark. I had pretty much achieved that after around 3.5km only for my left calf to tighten up a bit. There was no way that it would have allowed me to run home fast and I took the safe option of finishing the run off steadily. My final time was 25:51 which I was more than happy with. Only eight days earlier I was hoping to break 26-minutes; I had now done it twice. It will be interesting to see if I can go anywhere near that on my more hilly home course next time I run it. The gallop had also been very consistent with the five splits varying between 4:59 and 5:18. The week finished with a rare rest day on Sunday before I flew home to start another week. The totals for the week were 26.3km in two hours and 40 minutes with an elevation of 153 metres. I had enjoyed my tenure in the southern state but was looking forward to getting home.